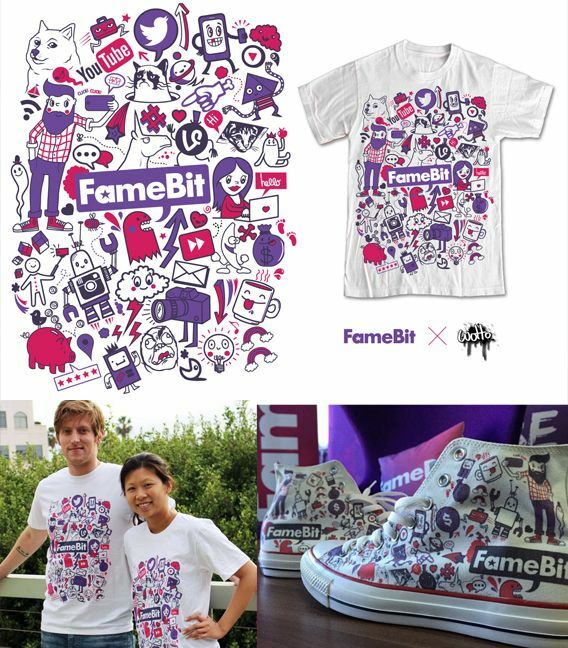 Famebit launches promotional t-shirts and shoes with doodle art by wotto. I recently had the opportunity to work with Famebit, a company that matches influential social people with products and opportunities. I was asked to create a promotional design that could be used on t-shirts and shoes, maybe other items too. After a short discussion they were drawn to my doodle style. It fit the job well and they gave me a long list of items, words and stuff that they felt visually represented their brand. I created a fun vector design that encompassed all of the elements mentioned, everything from ceiling cat memes to a selfie stick stick man! The color palette reflected their core branding and the final tee was printed really well. They gave away several pairs of converse shoes as part of the promotion, you can see them here. Famebit also sent me a nice care package to see the tee first hand, always a sign of a great client. The quality was good and another cool client was added to my list.